I spend a lot of time making the inside of our home look groovy, but I rarely (if ever) do anything to the outside. After installing my new Urban Mettle planter onto the front gate of my rental, I couldn’t believe I had waited so long to add a personal touch to the entrance to our home. Not only did it completely transform the look of the entrance, it actually beautified the whole block. Also, I will never underestimate the power of having something I love right in that threshold between the public and one’s private space again. The planter makes me smile every time I go through the front gate–which is huge. AND makes the numbers on the house actually visible–which is also huge because how annoying is it when house numbers are impossible to find!? Urban Mettle is a father-daughter team. (How cute is that?!) Holly, an interior designer by trade designs the planters and her father welds them. Cool, right? Their collaboration and their Etsy shop are brand spankin’ new and I’m thrilled to be able to offer you all a chance to win one of these lovely planters that can come with or without your address numbers. ( One brilliant part of the design is that the numbers are magnetic–so if you move you can take the planter with you when you go to your next spot, and you can order new numbers for the new address. 1. Head over to Urban Mettle and pin your favorite planter to one of your Pinterest Boards. 3. For additional entries, share your fave on twitter or facebook, then come back here and leave your URL-yadayada you know the drill. Leave up to three entries! The retail value of this giveaway is $250. The giveaway will end on Tuesday, September 3rd at 11PM PST. The winner will be chosen at random. International entries are welcome but you will be responsible for your own Duties and Taxes should they apply. Good luck! This post was created in partnership with Urban Mettle. Thank you for your continued support of the brands that hook me up, so I can hook you all up with content that hopefully doesn’t make you keel over in boredom. Also, all thoughts, experiences, photos, words, and kickassness are my own. Update! September 4th, 2013: Comments are now closed. –The randomly selected winner of the Urban Mettle Giveaway is #56 Tonia Please send your snail mail addy to hello (at) justinablakeney (dot) com! Congrats! Also, Urban Mettle has been kind enough to offer JB est 1979 readers a 15% off by using coupon code JUNGALOW now through the end of September. So go and get your Urban Mettle on! Can’t wait to get a house of my own! The father-daughter detail slays me. Oh this is just perfect! We have rented a house and I am trying to beautify the little patio with lots of plants. I chose a small one so we can put our inside joke numbers instead of actual house numbers..
Whoops, didn’t mean to reply to you! Sorry! Love this company! I’ve even pinned them before! Thanks to you and Urban Mettle for the giveaway! I’ve not seen these before. How very cool! I love that the numbers are magnetic. love love love this! it’s always the simplest ideas that are the best! genius! So amazing! Great way to bring a new look to your home on the outside! Very nice product! Thanks for this giveaway! Oops! Forgot my pinterest link! perfect addition to a front porch vignette ..
Wow your entry looks great! Thanks for this fun giveaway! unique and handmade… ideal !!! Steel that looks like copper and MAGNETIC numbers! So simple, so brilliant. these are gorgeous! my oct. 1st move-in date to a new place can’t come soon enough. Love these! Would so spruce up the front of our Historic Spanish Colonial in Long Beach, California. So amazing! Any of these would look great in front of my door. I put it under Products I Love! Oh I love these!! I just pinned it to our “new home” board as we just bought a home and this would look amazing on our new house! Love!! We just bought our first house two weeks ago and we needed a mailbox. I considered using this exact one as a mailbox!! Thanks for the opportunity to win one!!! Toni, we are creating a mailbox as we speak! It should be available to purchase next week. I love them even more because it’s father daughter art! here’s mine. Too bad I’m not on twitter or facebook anymore! Hugs to you Justina and thank you always! Love this! Would love a house number one for when I am not renting in a oh so strict homeowners association neighborhood… I love this planter one though for right by my entry! How incredibly fortuitous! I have been searching for house numbers for MONTHS and this is so beautiful! I have about 50 propagated succulents in pots in my backyard that are just screaming at me to get a place in this adorable planter. (blue chalk) fingers and toes crossed!! Here’s hoping that I win something :) These are gorgeous & would look perfect on my new home!! Can I hang this indoors ya think? If I win it, it just might be goin’ inside. I love the form and function of this! This would look amazing outside my new house. They are beautiful! I’ve had one if these on my wish list for a house we are moving into in Silver Lake! VERY COOL! Here’s my Pin! Ooooh, these are so pretty! Must have! The best looking planter/house numbers ever. This is perfect for my house as we are 106! Such a unique giveaway. Love it! Yay! I hope, I hope, I hope! Wow! These are all amazing. Would love to win. Thanks for the chance. Love the look for the front of a 1960’s ranch. Not sure how to show a Facebook link! Urban Mettle’s work is amazing! LOVE! What a great giveaway. we need new house numbers, and i LOVE succulents, so these are perfect!!! This would be so beautiful in our backyard that we’re fixing up right now! Right in my own town, and I never knew about them. These are so cool I started a Pinterest account just to enter the contest!! One of these address planters would be PERFECT for my house! These are beautiful! We’re getting ready to tackle to outside of our new house and this would really be the icing on the cake. We are in the process of updating the exterior of our home, and this would be perfect!! Thanks so much for the chance to win! So gorgeous, I love this. It certainly does make your entrance. So cool Father daughter team. Happy to do it. Such a beautiful item. So very beautiful. 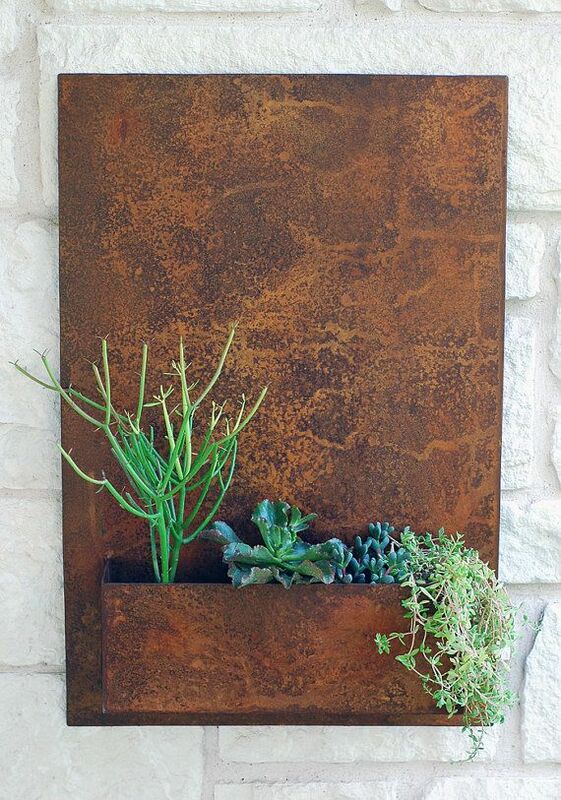 I love succulents and the metal would look great on my wood side paneling. I love this – thanks for sharing! Love the thought of being able to beautify your block! Love these planters!!! One of these would certainly improve my house’s curb appeal! What a bit of vintage lovely for some curb appeal! Heel mooi en lijkt me leuk om te winnen. Very nice and I love to have one. Sorry……… And now with my name. Very nice and love to have one. This horizontal planter is so unique! This is a very trendy, minimal piece that goes with any home style. I chose one without the house numbers so I could take it when I move. What a beautiful way to add welcome and charm to an entryway. I pinned it to my “Failte” board on Pinterest which means “welcome” in Gaelic. So fab for curb appeal. I love all of these, but this is the one my hubby liked the best. It will bring such a pop of color and life to our backyard! I want it – I really, really want it! These planters are so beautiful!! So pretty! This would be perfect on the front of my house! Not sure how to do the fb link, but if this doesn’t work I’ll send a screen shot! So neat looking! This would look great on my log cabin porch! Love the dad and daughter duo! So very neat, this would look great on our log cabin porch! Also love the dad and daughter duo! Love these! Would looks awesome on my front porch. Great idea! These planters are darling and would look lovely on my new to me 111-year-old home. Like it all! Original ! Father/Daughter team :) most attractive street address planter ever seen ! Magnetic numbers ! Letters too?? Party here? Welcome? Store sign?? I want this! I love this planter! It would look great on the front of our house!!! It definitely fits the décor of our west texas house! I saw all these several months ago…perfect for my new courtyard redo!!! Oh my gosh this would look so cute outside of my house! So special! Let’s hope I win! So awesome for our new house! I love the blend between modern industrial and the tiny succulents for this box. What an awesome idea! these are beautiful and I would love one for our house, which has no numbers! Thanks for featuring this awesome giveaway! Love this, in the Phx Modern Desert this is perfect! This is so beautiful – I absolutely love this and I have looked for months for something that is worth putting up. This blends metal & nature into functional beauty. How rare and breathtaking. A statement I want next to my front door!! LOVE IT!